How to properly DEselect an item on RecyclerView? Why aren't the buttons and texts showing up on the xml file? Why is Android Mobile SDK connect.iq broken? Is it possible to compare the position of data with the string values taken from database inside the BindViewHolder in android? I followed this answer: https://stackoverflow.com/a/30046476/8793443 and got it to work: only one item is selected at a time (which is what I want). However, when the same item is clicked for a second time, it remains selected. How can I deselect it so that it goes back to it's original color background? 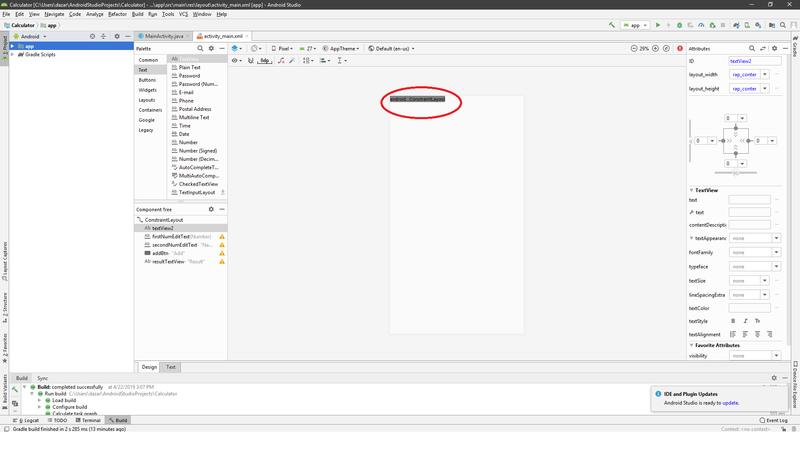 The problem comes from when I'm trying to interact with my design(only the gray area with android...ConstraintLayout appears ). I'm getting started with android studio, and I have a some experience with Java. Here I'm trying to create two plaintext fields that accept numbers as input and returns the sum when the user creates clicks on the button. I'm using Android Studio 3.3.2 and an OpenJDK 64-Bit server VM by JetBrains. I'm expecting my design to be similar to the one in the video. All comments and suggestions are appreciated. Downloaded Garmin Android Mobile SDK. Unzipped it. Copied it to Libs in my project. The file looks like it has a vertical zip on the icon. Unable to open and view the file in Studio. Unable to get the instance of ConnectIQ object as Studio unable to resolve the symbol ConnectIQ which is therefore shown in red. I have a dialog which i set to play video in fullscreen on button click in recyclerview.So whenever i tap on fullscreen button on video player it crashed with IllegalStateException: The specified child already has a parent. You must call removeView() on the child's parent first. I don't want to remove view from recyclerview cuz i when i add back same view it overlap items on recyclerview. So i created new Video player instance and give it to dialog's addContentView method but its give same error. The problem is that the bottom items (from Green to the bottom) are faded and never get un-faded. 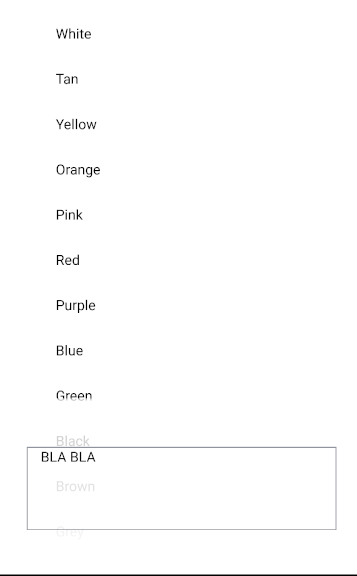 Is there a way to tell the RecyclerView to scroll until the last item is above the "Bla Bla" frame? but still have the edge effect. but AS doesn't see this file. Maybe the last AS update caused such problems and I have to downgrade my AS? I have used this method for so long time and it worked well.